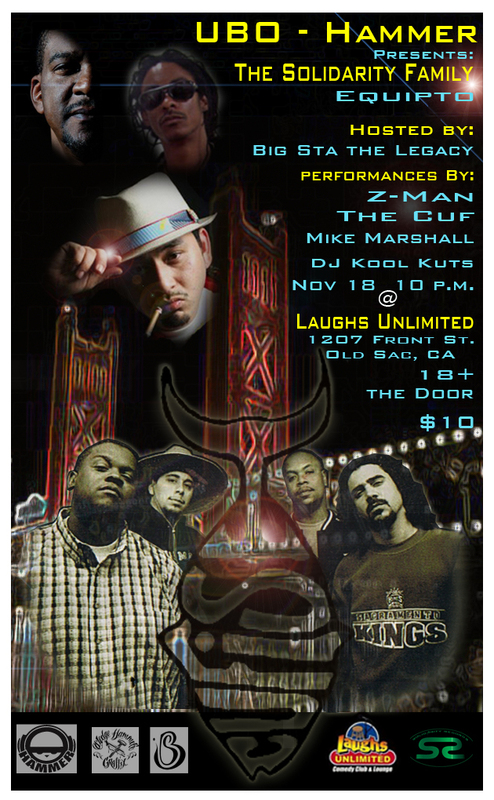 This 18 and over hip-hop event goes down on Thursday November 18, ’10 at 10 pm, $10 entry, special group prices, ask at the door or e-mail to pay in advance: ubohammer@gmail.com. VIP Booths available upon request, first come- first serve. Purchase an event space to sell merch for just $20, includes two passes, pay at the door. Equipto and Solidarity is in Sacramento, do not miss this, along with legendary local hip-hop cult group, The CUF. This year, The CUF was inducted into the hall of fame for Sacramento News and Review’s music award event, The SAMMIES. DJ KoolKuts, nominated this year and last year for a DJ SAMMIE will be ont he ones and twos. Our cover act, Equipto; known for his album with Andre Nickatina and his San Francisco-based hip-hop group, Bored Stiff, has music videos coming out with The CUF, including one released Nov ’10 with Pete B from The CUF. Along for the ride and a must see is Mike Marshall [who became popular to younger urban music fans in the ’90s with the hook he sang on The Luniz, “I Got 5 on It” but better known in music history for his group, Timex Social Club. Also on the stage is Z-Man from One Block Radius. Z-Man has performed many shows recently in Sacramento so if you haven’t seen him, pop on through Thurs. the 18th to see why he is gaining popularity in Sacramento. Our host, Big Sta The Legacy is an Oakland-native and now has moved and sprouted his career in hip-hop within the Sacramento region. Big Sta will be hosting this show and worked hard to help put this event together, perhaps you will hear him perform a few of his joints. Finally, if you didn’t come to the show for anything else, then come out to meet and greet with A.C. Owner of SledgeHammer Graffix [screen printing] and Co-Owner of UBOHAMMER, a multi-media duo that also includes Aaris A. Schroeder Owner of UBO MAG, that combines graphic design, fashion, screen printing, marketing, public relations and journalism all into one. Look out for his hand printed posters made especially at this event and pick one up for just $5. T-Shirts will be for sale and other designers, screen printers and artists are encouraged to purchase booths for $20 to sell merch.